The addition of Bonderman and Bruckheimer provides the strongest signal yet that the Oak View Group intends to bring an NHL team to Seattle near-term and an NBA team further down the road. A modern KeyArena under a historic roof, more big-time concerts and at least one new sports team — more likely a hockey club before a reincarnation of the Sonics. That’s what Mayor Ed Murray and a collection of sports and entertainment executives on Wednesday said Seattleites can expect, as Murray officially announced Oak View Group (OVG) as his administration’s preferred choice to renovate KeyArena. Introducing Hollywood film and TV producer Jerry Bruckheimer and billionaire investment banker David Bonderman as partners in the project, OVG said it intends to pursue an NHL team in the short term and an NBA team down the road. Signing a letter with the 55-year-old Seattle Center venue as a backdrop, Murray and Leiweke agreed to negotiate a memorandum of understanding (MOU) — and dealt a blow to a rival arena project pitched for the Sodo District by entrepreneur Chris Hansen. The MOU with OVG would go to the Seattle City Council for approval. The mayor said his goal is to complete the KeyArena deal before he leaves office at the end of the year and described it as integral to a grand vision for Seattle Center. Built for the 1962 World’s Fair, the aging civic campus is now wedged between a dense downtown, Queen Anne and a booming tech-business hub in South Lake Union. “It’s now time to seize this historic moment of growth and innovation in Seattle to build an arena for the 21st century,” Murray said. “This is one part, one piece of a larger plan that is already in place to make Seattle Center an international icon district on par with Chicago’s Millennium Park” and cultural areas in Hong Kong and Montreal. OVG’s $564 million proposal — one of two bids submitted in April — includes a partnership with major concert company Live Nation and would involve building “an entirely new area” under the venue’s existing roof, which is expected to be given historical landmark status. 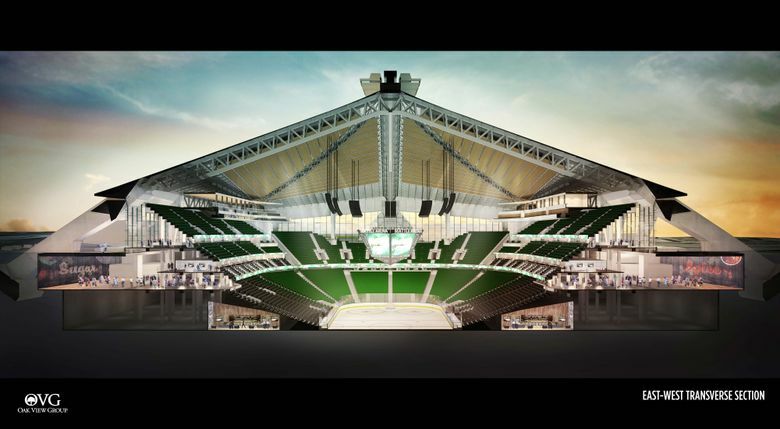 Though it was Seattle Partners that requested $250 million in public bonding, OVG is seeking a minimum of $40 million in city taxes and revenues from the renovated arena. “That’s something we will work out with them to get the city the best deal possible,” Murray told reporters. The mayor said outstanding challenges, such as how a renovated arena would impact transportation in a crowded neighborhood, could still derail the deal. Light rail is coming to the Seattle Center neighborhood, but not until 2035, according to Sound Transit’s projections. Nicole Grant, executive secretary-treasurer of the Martin Luther King County Labor Council, praised the OVG plan, saying union workers are ready to make the renovations and serve KeyArena patrons. Melinda Giovengo, president of YouthCare, said the proposal includes funding and potential job training for young people experiencing homelessness. But Murray and Leiweke were careful to downplay the possibility of men’s pro basketball returning to Seattle anytime soon. They said the NBA isn’t close to adding teams. Vancouver, B.C., Canucks owner Francesco Aquilini was on hand Wednesday, lending support to the prospect of a Vancouver-Seattle hockey rivalry. “We are already hard at work pursuing every opportunity,” Leiweke said. As for Hansen’s proposal, that remains in the hands of the City Council and is “technically still alive,” Murray said. But the mayor favors KeyArena, and Leiweke made Hansen a very public offer Wednesday as the news cameras rolled. A Hansen spokesman declined to comment, but Hansen spoke at a Civic Cocktail event Wednesday night in Seattle. According to tweets by The Associated Press’ Tim Booth, Hansen said he would not sue the city for engaging with OVG while he has an MOU, adding, “I’m in for what’s best for Seattle. Bonderman has been a minority owner of the Boston Celtics NBA team for more than a decade, and Bruckheimer is a close acquaintance of NHL Commissioner Gary Bettman and has long expressed a desire to become a franchise owner. The NBA is believed to be five to 10 years from expansion. But the NHL, which will launch a new Las Vegas franchise this fall, has an imbalance between its Eastern and Western conferences and could even things out by adding a Seattle franchise. Bonderman, 74, is a University of Washington graduate and a longtime friend of Mariners owner John Stanton. He is the chairman of buyout firm TPG Capital and is listed by Forbes as having a net worth of $2.5 billion. Representatives of the Mariners, Seahawks and Sounders attended Wednesday’s news conference. He was described a decade ago in Hollywood’s Deadline magazine as the NHL’s “Ultimate Mr. Showbiz’’ given his “ice hockey obsession” and longstanding desire to own a franchise. This isn’t the first time Bonderman and Bruckheimer have teamed on a sports venture. In 2007, Bonderman was an “equal partner” in a bid group formed by frontman Bruckheimer and MGM studios chairman Harry Evans Sloan that looked into bringing an NHL expansion franchise to Las Vegas. The group bowed out in 2010, citing the economic recession that devastated the Las Vegas real-estate market. Bruckheimer also looked into buying the Pittsburgh Penguins in 2006 before a group led by Mario Lemieux purchased the team out of bankruptcy protection and kept it in place. But Bruckheimer has remained close with top NHL leadership, including Bettman, frequently appearing at celebrity events at the All-Star Game and throughout the year. Bettman told the Las Vegas Review-Journal in 2009 that he considers Bruckheimer a good friend and thinks he would make a terrific league owner. Documents released by the city of Seattle on Wednesday show that an executive-review team and other advisers were impressed by OVG’s financial capacity even before Bonderman and Bruckheimer were brought aboard. In an interview before Wednesday’s event, Murray predicted the new additions would net Seattle an NHL team before an NBA team. Murray said the city’s focus moving ahead will be on better integrating the OVG proposal within the surrounding neighborhood and ironing out certain financial details — such as parking revenue and tax requests — to better protect taxpayers. He said stakeholder opposition from other pro teams in Sodo likely would make it difficult for the council to approve advancing Hansen’s project unless a binding event-scheduling deal can be obtained. The Port of Seattle also has been outspoken in opposing the Sodo project, citing traffic and freight-mobility concerns. Bonderman would have to divest his Celtics shares were he to become an NBA owner at KeyArena. For now he will focus on getting the KeyArena rebuild going and helping bring the NHL here first. Bonderman and Bruckheimer join other OVG equity partners Madison Square Garden Co., Live Nation and Delaware North — a concessions company founded by Boston Bruins owner Jeremy Jacobs — to help supply project funding.